I love Disney just as much as the next American but there is a group of Disney lovers that take the love of Disney to a whole other level. I affectionately refer to these people as “Disney Freaks”. Embrace them. Love them. Get to know them because their love for all things Disney usually follows with their wallet. SIDE NOTE: I googled ‘Disney Freaks’ to see if I could come up with some sort of fun graphic and discovered that this is a REAL thing out there. I thought it was just what I affectionately called these Disney lovers, turns out the Disney Lovers call themselves freaks too. When I lived in Southern California I had an annual Disney pass on and off for years. 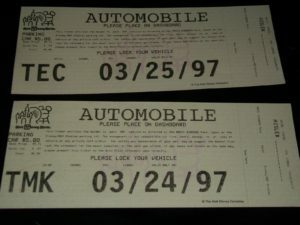 I even bought a pass after I moved to Arizona and would make time to visit the park on just about every trip back home. During Disneyland’s 40th anniversary celebration there were different trading cards each day available to guests at various locations throughout the park. My sister Tina, two friends from work and my friend Tricia drove from El Segundo, CA to Anaheim EVERY DAY and got a full and complete set of those trading cards. That is a special kind of Disney Freak. 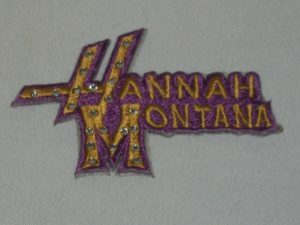 While I was waiting for my home to be built in 2002-03, I consistently searched eBay for fun and unique items to decorate with. 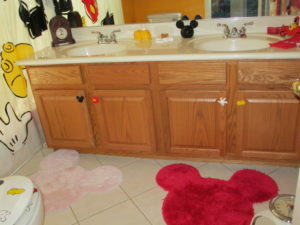 I knew wanted a Mickey Mouse themed bathroom and spent too much time searching for the right items at the right price.When I finally moved in, the first room I worked on was the Mickey Mouse bathroom. Every item in this room was either purchased on eBay or something I already had. It was soo fun and easy to put together. It quickly became the favorite place for the neighborhood kids to come when nature called and it made me feel good that they loved this room as much as I did! 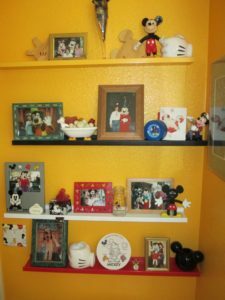 As much as I love Mickey Mouse and Disneyland, I never considered myself a ‘Disney Freak’, but I learned long ago the value of knowing these folks are out there and they like to buy stuff. Weird stuff. Stuff you and I would just throw away. 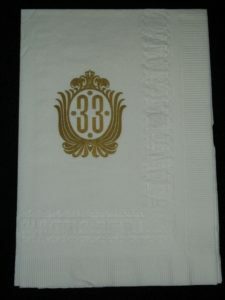 A few years back I had the chance to attend a work conference at the Disneyland Hotel. 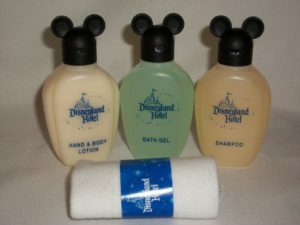 I had never stayed at that property before but I knew that the fun Mickey themed shampoo bottles would sell on eBay. I knew this because while shopping for my bathroom I saw a lot of stuff I’d never considered selling before. 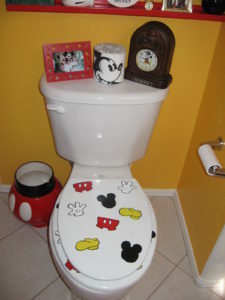 I also bought stuff I’d never think I’d buy, like a roll of toilet paper for $5 because it was wrapped in Mickey paper or what I consider to be the most outrageous purchase for this room, the $50, hand painted, Scattered Mickey themed toilet seat! Yes, folks, I spent fifty hard earned dollars on a toilet seat and I LOVED IT! Yet I still don’t consider myself a ‘Disney Freak’…but maybe I am. Part of the fun of selling on eBay is finding things that you think are worthless or trash, taking a few pics, creating a listing and waiting to see if that item sells. When it does I shake my head, smile, and happily add some cash to my bank account. See that red trashcan next to the toilet? It was broken by one of my nieces, but I glued it back together. It has a good sized chip missing from the rim but something tells me that someone would still want that for some reason! I haven’t listed it yet, but I haven’t thrown it out either. Every time I touch it I give it a thought, but I haven’t actually listed it to see if someone would, in fact, pay money to have a repaired and chipped ceramic trash can in their collection. When I stayed at the Disneyland Hotel I decided to take any of the paper advertisements, post them on eBay and see if they’d sell…of course they did! 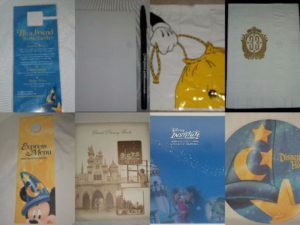 I took the laundry bag, the paper pad and pens, drink coasters from the restaurant, the door hangers, breakfast menu, advertisements for the special events….anything that I thought a ‘Disney Freak’ would love to have. I listed them and sold them! People are crazy like that! 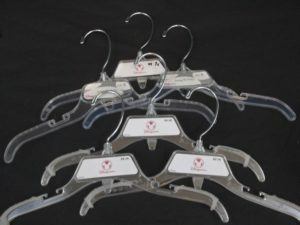 When I purchased a bunch of clothing clearance items at the Disney store one year, I had all these Disney store hangers in the closet. I was going to toss them out one day while I was cleaning and re-organizing, but instead, I listed them on eBay and they sold! Plastic hangers people! While attending our community’s bi-annual garage sale one year I stumbled on a bag of Disney gift boxes, tissue paper, and a few other items. I didn’t really pay attention to what was in the bag, I just felt that for $1 I couldn’t lose. When I got home and sorted through that bag it was full of items that would sell faster and bring in more money than those gift boxes. I had a Disney World park map from 1996, parking passes from the day, stickers, and a variety of other park-related items. I quickly got those things posted and sold them for $10-15 each. Not a ton of money, but it was fun to see that what some would consider trash others would pay $15 for. Are you a Disney Freak? Have you sold any fun or unusual Disney related items? Have you found something most would consider trash but you saw the value and turned that item into a few bucks? Here are some of my most recent Disney related sales.